My Little Guy Always Has To Take Messy Play To A New Level!! A lot of you have seen this picture, it is a few weeks old. 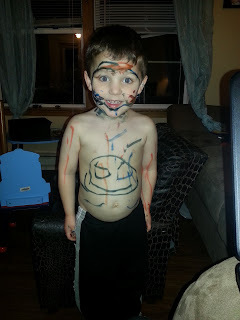 This is how my son colors with markers! Hahaha, he is so creative! My youngest daughter also another idea of how to play, hahaha... Well, I do think he has some great creative ideas! Haha- he is so cute! !